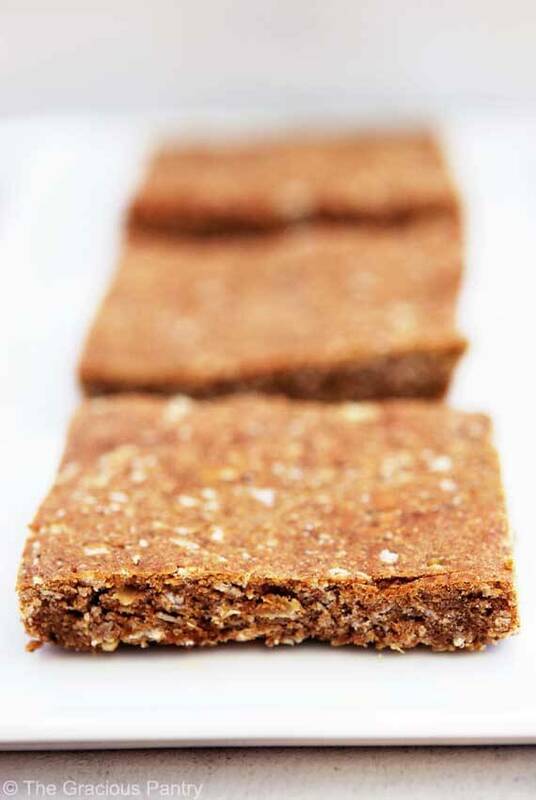 These clean eating pumpkin spice protein bars are wonderful for a fall “meal” on the go! I’m really having fun with this protein bar thing. The last batch I made was cinnamon chocolate chip and it was pretty tasty. So I just had to try another favorite, pumpkin spice. I should tell you that these bars are not “cookie sweet”. So don’t expect that. They have a very mild and subtle sweetness to them. But the pumpkin flavor is pretty pronounced. But they are filling and I usually enjoy them with a glass of mildly sweetened almond milk. The combo is delicious and I feel pretty full afterwards. You can add some extra sweetness if you want it by adding about a 1/2 to 1 tsp. pure liquid stevia to give the sweetness of the honey a little extra punch. But outside of that, I would just enjoy them as they are meant to be. 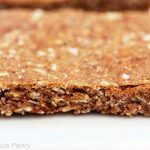 An autumn-inspired protein bar that is not overly sweet and offers a nice hint of pumpkin spice. Allow to cool. Slice into bars and store in a Tupperware container or Ziploc bag. Have you ever baked with quinoa flakes? I’m trying to use less oats and have substituted quinoa in some of my recipes, but find they cook differently. More protein though, so I thought of them when I saw this post. what flavor Whey Protein do you use for this? I used an unflavored whey that I buy in bulk at the health food store. But I imagine you could get away with using vanilla flavored, although it would change the flavor a bit. (Not bad, I’m sure… just different). Are these supposed to be crunchy or chewy? Lisa – The oats are chewy. They are a bit more on the chewy side due to the grains. Can I use soy protein powder instead of whey? Stephanie – Sure! Whatever powder works for you is fine. Hmmm, going to try with some butternut squash! I have a batch of these in the oven right now. I used vanilla protein powder and fresh pumkin i cooked down a couple days ago. I hope they turm out good because the batter sure tastes yummy! Do you have any other method of toasting the oats? Every time I follow the directions my house fills with smoke even though the oats aren’t burning. Tonight they barely even browned and were still smoking to the point that I had to pull them out of the oven. My oven only smokes when I toast the oats and not when I’m cooking the bars so I know it has something to do with the oats and not just a dirty oven lol. I love the recipe though and have made many flavor variations of it since finding you. Lori – I’ve never had that problem. Try stirring them part way through. Or, you may need to turn down the temp a bit. You could always dampen them slightly with a little water, but I’m not sure if that would help or hurt. I’ll have to investigate on this one. I just baked these off. They are delicious! I’ve tried the Eat Clean Diet protein bar recipe and it’s sooooo dry. One question though, the recipe includes “1 serving= 1 bar” but you don’t say how many servings are in the recipe. What would qualify as a serving compared with the nutrition facts that you provided? Katie – I cut batch into 15 bars. That is what I based the nutrition data on. Glad you enjoyed them! My son is allergic to peanuts, will almond butter work as well? thanks, I have been looking for something like this to put in his lunch. Jane – It should work just fine! Enjoy! Why honey??? 500 odd calories and 139 grams of sugars that you can do without!!! Have you tried not using sweetener in your recipes?? Maybe a more savoury snack? Surely if you use perhaps a butternut pumpkin then the sweetness of the pumpkin would be enough. I skipped the honey and doupled the pumpkin! Pretty good I must say! I also used 1/2 cup peanut butter and extra applesauce.. maybe this will help eliminate the extra calories for you! They turned out very moist! Dolce – Fabulous!! Thank you! Do you have to use the quick oats? Can you use rolled oats? I only have rolled oats or steel cut in the house 🙂 Thanks! Lauren – You can try, but the bars will be much tougher. I usually eat steel cut myself, but I felt this recipe really needed the quick oats. Anything else just doesn’t bake the same. Not that it won’t work, but it will be more like eating raw oats. What kind of peanut butter are you using? Is this an all-natural sugar free (the kind with the oil on top), or is this the regular grocery store type? Karyn – It’s the all natural stuff. I never buy the other stuff because they add a bunch of unnecessary garbage to it. The real stuff is best! Susan – You did the right thing. I wouldn’t leave these out of the fridge for an extended amount of time. Do you know if substituting brown rice protein powder will change the flavor of the bars? Rach – With brown rice powder, it’s more a texture thing than a flavor thing. Rice powders are far more gritty, and since I’ve never baked with them, I don’t know if that gritty texture stays put after baking. But flavor wise, you should be fine! Delish, I used a mixture of spelt, oats and flax, gave it a very nutty texture, I also processed the oats as I didn’t have the smaller flake variety..great recipe 😀 I will def make it again and again! Denmchfort – Fantastic! I’m so happy you enjoyed it! Ktab – Yes, technically speaking, whey powder is processed. It’s one of those personal choice things. I rarely use it anymore because I get plenty of protein in my regular diet. But I know lots of clean eaters who use it. The choice is yours. How long will these stay for in the fridge? Bquinn – Probably a week or two at the longest. They’ve never lasted that long around here, so I’m not positive. Might be better to keep them in the freezer if you won’t be eating them quickly. Eliza – That’s so awesome!! I would love to see a Dutch chocolate protein bar recipe! Awesome! I’ll add that to my list! Jessie – I have no doubt! Lindsay – Yes, it’s one full cup, not a scoop. However, elevation could make a difference, or maybe something got mis-measured on accident. Try using 1/2 cup next time and see if that helps. It could be a lot of things. I am having the same problem as Lindsay. I have made these twice and I have made the chocolate chip ones and they are not crisp looking at all and they crumble and stick to the pan. I am going to try greasing the pan next time, but I cannot figure out what else I am doing wrong. Thoughts? Jodi – Try and ext a 1/4 cup peanut butter and and extra 1/4 cup apple sauce. Let me know how it turns out. Ashley – No, I haven’t. But there are plenty of other protein powders on the market that you could sub. Lisa – Thanks! Glad you like them! Could you substitute Quinoa flakes for oatmeal? I may try it. Makes it higher in protein and easier for some Glutten-free’s to digest. Grannycmc – I’m not sure. I’ve never used quinoa flakes. Sorry! Yes, the type of powder will most likely make a difference. Sorry it didn’t work out! Depends on how you cut it. I got 15. It probably would. Let me know how it works out! I would love to see more protein and granola bar recipes 🙂 perfect for this on the go mom! How long do the protein bars store for? In the freezer, about 6 months. Made these today, and yielded about 24 squares. left out the honey, but went with 1C of Pumpkin, 1/2C of Peanut Butter, and 1C Unsweetened apple Sauce. I use alot of Pampered Chef bakeware, and the 20 minutes in the oven was perfect! Very Moist, and soft. Not chewy at all….. I would love to know what the best sub for honey is – i ran out last week and will not be going back to the store for another 2 weeks. any suggestions? Casey – What type of sweeteners do you have in the house? Susan – They are not crunchy. As for giving them to toddlers, that would be a personal decision. I have heard different things about that, so it’s best to ask your doctor or pediatrician.